Our team completed a number of projects for local home and business owners recently. You can read summaries of a few of those right here. Customer Issue: The customer’s hotel driveway gate opener broke down, and a new one that could move the heavy iron frame was needed. Our Solution: For a large metal sliding gate like this one, our team ordered a state of the art Elite SL3000UL unit and worked it into a preexisting shelter before hooking it up. 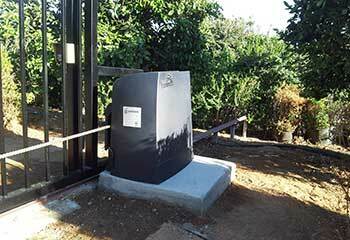 Once the unit was linked to the owner’s smartphone, the gate was back in business. Customer Issue: Insufficient treatment and cleaning led to the swinging gate’s hinges rusting, until the top one broke partially off. 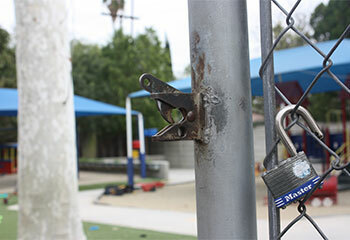 Our Solution: Our team removed the gate and the corroded hinges, and then welded new ones in place before reattaching it for testing. We instructed Mr. Wilson on how to prevent this from happening again with regular lubrication. 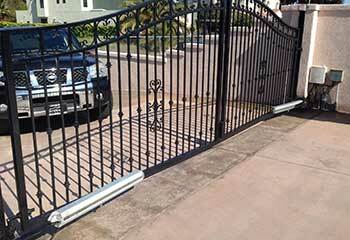 Customer Issue: Recent home security issues led Mrs. Ferreira to decide it was time to add a gate to her previously open driveway. Our Solution: Our team assembled a single-swing vinyl panel gate, with a Liftmaster LA400PKGU opener and an Eagle Entryway intercom with security cameras built in. The system was synced up to an 811LM LiftMaster remote control.